DENVER (AP) — Jon Gray altered the grip on his slider and set his aim higher in the strike zone. For this, he credits a tweak to his slider — he’s using the index finger to create more spin — and a decision to own the top part of the zone. Gray was letting his fastball fly as his long, blond hair flew in every direction. Reliever Bryan Shaw allowed a run in the seventh and Wade Davis another during a shaky ninth in a nonsave situation. But Davis fanned Manuel Margot to end the game and help the Rockies take two of three from San Diego. It was their first home series win of the season. This game turned into a strikeout-fest, though, with the teams fanning a combined 27 times. Tyson Ross (2-2) allowed four runs in four innings and struck out seven as he dropped to 0-6 lifetime at Coors Field. He didn’t have the same sort of stuff as his last start, when he took a no-hitter into the eighth inning at Arizona. Gray found himself in a one-out, two-on jam in the fourth. After Franchy Cordero struck out, Chase Headley flied out to end the threat. Rockies: Freeland remains sore after taking a liner off his left heel in Tuesday’s win. “Hopefully he’ll be ready for his next start,” Black said. ... OF Carlos Gonzalez (strained right hamstring) began hitting in the cage. Rockies outfielder Gerardo Parra is in Miami as he serves a four-game suspension for his role in a brawl against the Padres two weeks ago. Actually, the Marlins are in Los Angeles playing the Dodgers. Wolters drove in a run with a single and another on a sacrifice fly. He also threw out two runners at second. “I love throwing guys out,” Wolters said. Myers was impressed with Gray’s location. 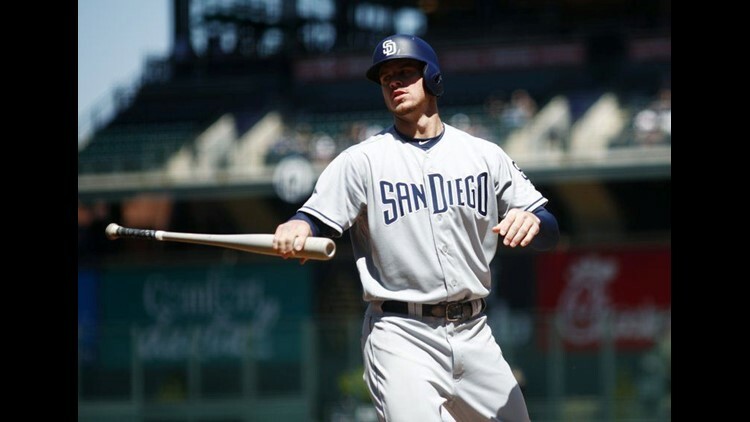 “Today was just one of those days that he was just on and locating his pitches well,” said Myers, who had one of the three hits off Gray and a double in the ninth off Davis.